The new Ammiraglio del Tempo (Admiral of Time in Italian) from Bulgari is an exceptional timepiece for various reasons. It features a minute repeater activated by an innovative slide, a Westminster chime, a detent escapement, and a constant force device. All in the signature case of Daniel Roth, the brand that Bulgari acquired in 2000. The detent escapement was invented in the 18th century to enhance the accuracy and reliability of timekeeping instruments used by sailors despite the inevitable pitching and rolling of the ships. While contemporary devices involved two impulses imparted to the balance via the lever, the detent escapement generated a single impulse regulating both the energy supplied by the barrel spring and its retransmission and redistribution to the balance. This was of crucial importance at the time since the ensuing reduction in friction between the moving parts led to appreciably improved precision. Developing a detent escapement in a wristwatch is a proof of mastery that very few watchmakers successfully challenged. 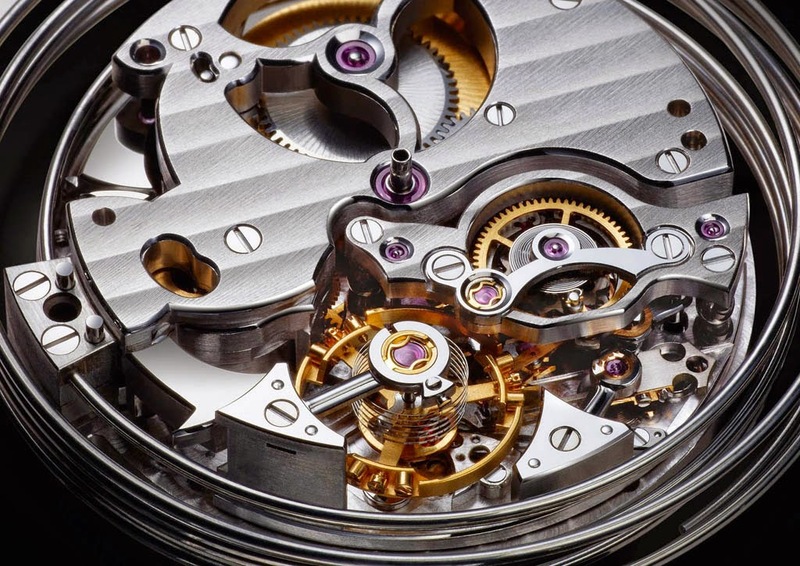 In fact, the vast majority of mechanical wristwatches are fitted with lever escapements due to the difficulty in miniaturisation and ensuring reliability within the small space afforded by wristwatches. The manufacture-made hand-wound movement, beating at 14,000 vibrations per hour (2Hz), is comprised of 516 parts and is also equipped with a constant-force device: a permanently wound intermediate spring positioned in the gear train connects the mainspring to the escapement and transmits regular torque to the escapement with minimal loss of energy. The power reserve is 48 hours. The 50 mm x 45.75 mm case offers a big surprise when it is time to activate the striking system: one of the lugs is mobile and serves as a repeater slide that glides from 7 to 8 o’clock to trigger the minute repeater. A clever solution that preserves the beautiful design of the case. 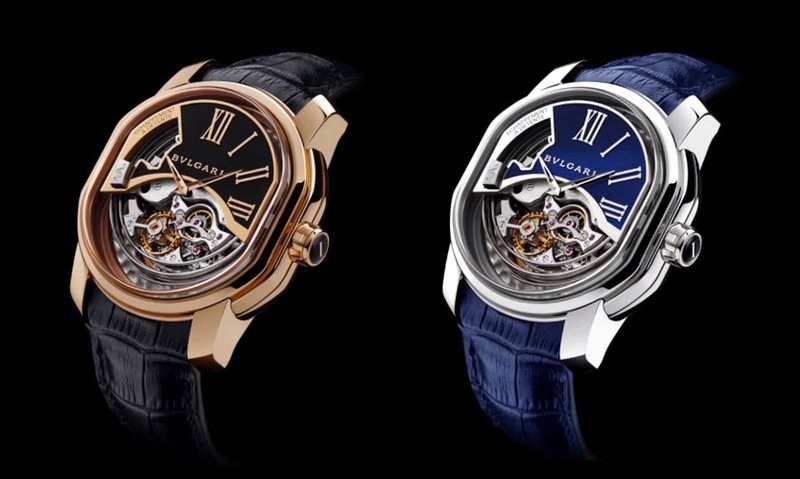 The partially open dial reveals the detent escapement as well as the four striking hammers and gongs. 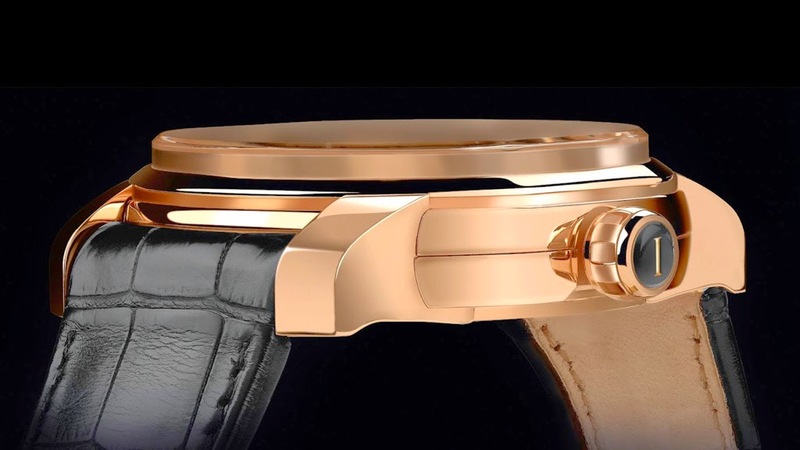 The solid part of the dial is made from a plate in black or blue gold according to the metal of the case. 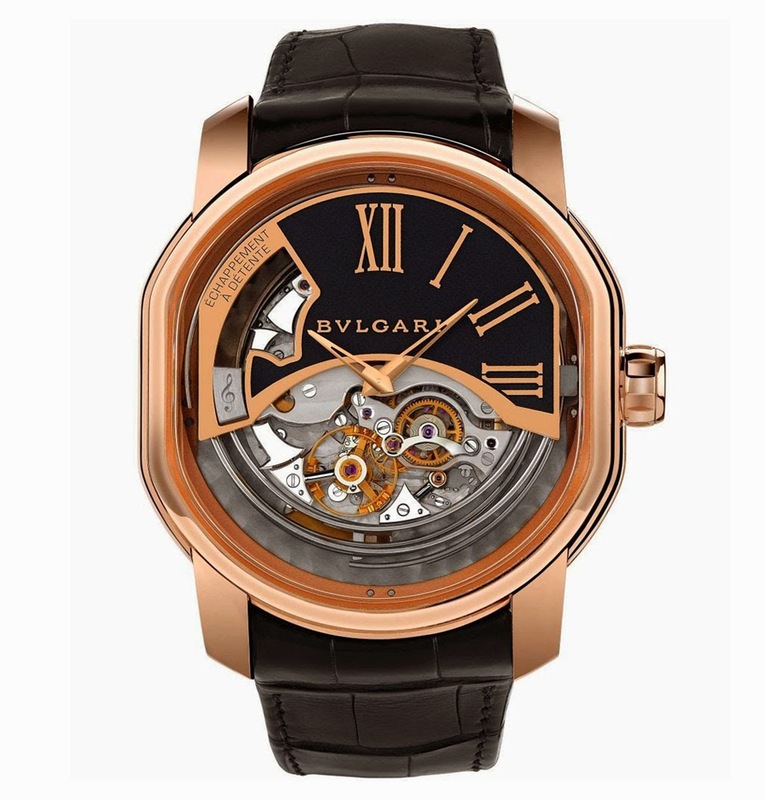 The Bulgari Ammiraglio del Tempo is issued in two limited series of 20 pieces in pink gold, and 10 in white gold. 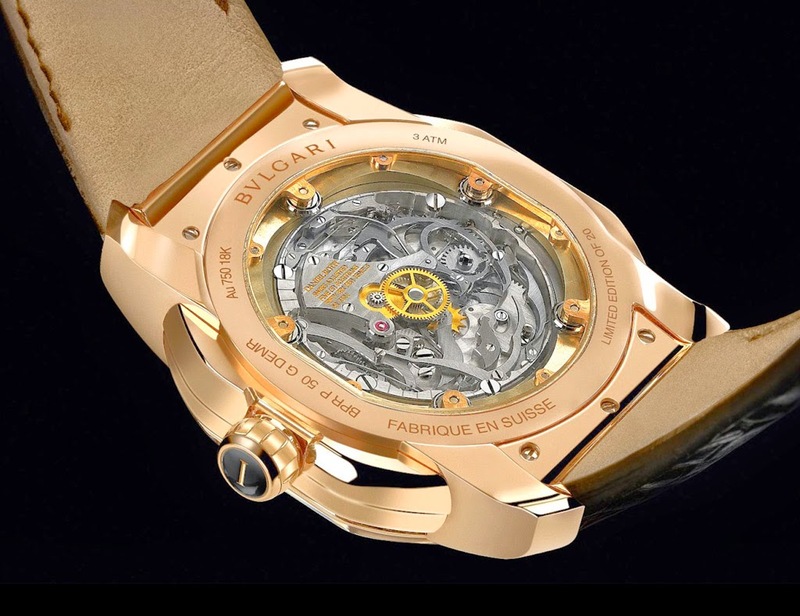 The individual number of each watch is impressed on the sapphire crystal disc adorning the crown. 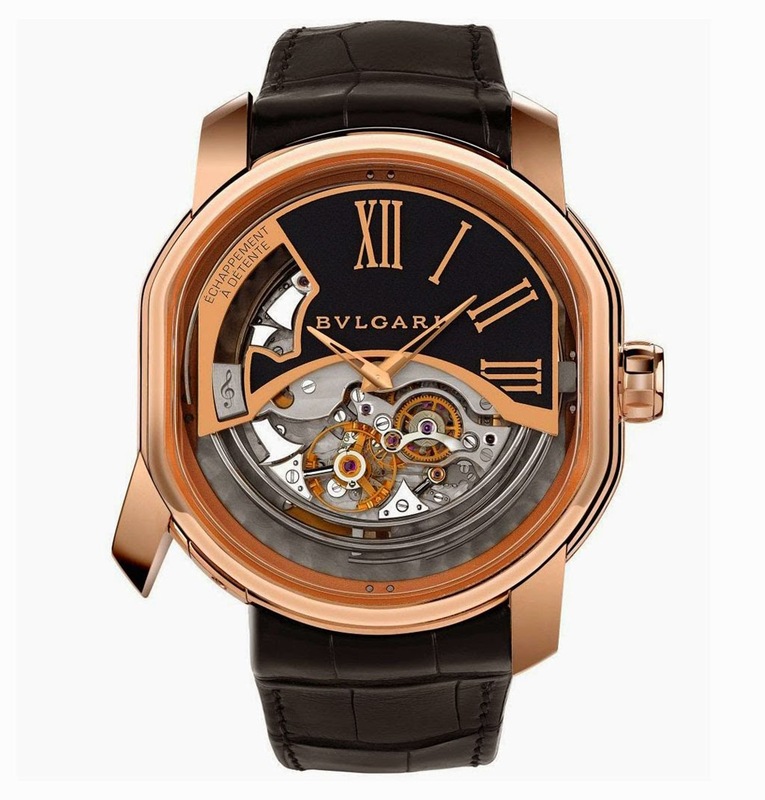 Enjoy the special video created by Bulgari for this exceptional timepiece. The new Ammiraglio del Tempo (Admiral of Time in Italian) from Bulgari is an exceptional timepiece. It features a minute repeater activated by an innovative slide, a Westminster chime, a detent escapement, and a constant force device. All in the signature case of Daniel Roth. 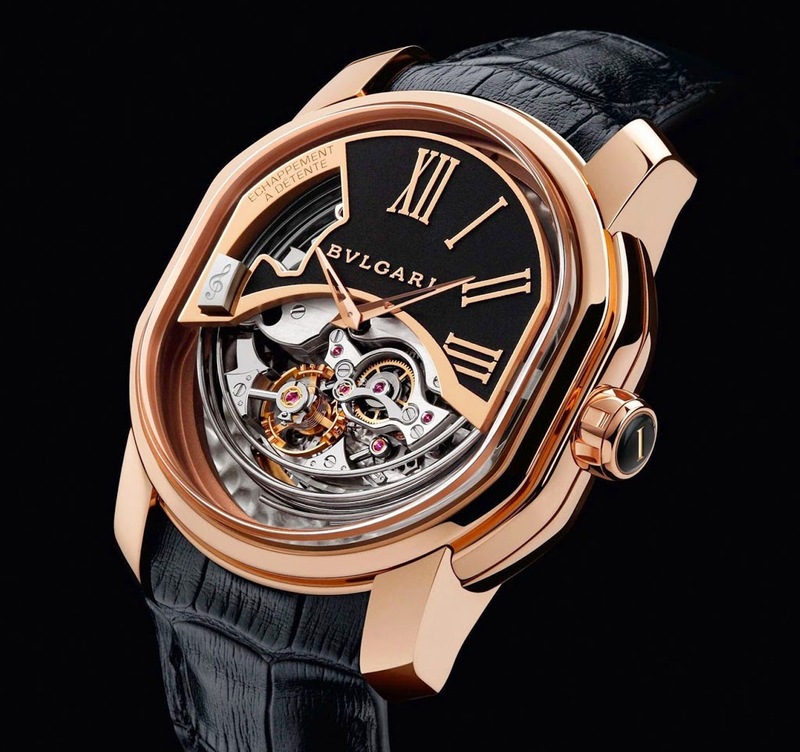 The Bulgari Ammiraglio del Tempo is issued in two limited series of 20 pieces in pink gold, and 10 in white gold.